Pumpkin is full of vitamins, fiber, and antioxidants.Not only pumpkin is loaded with vitamin A and antioxidant carotenoids, particularly alpha and beta-carotenes, it’s a good source of vitamins C, K, and E, and lots of minerals, including magnesium, potassium, and iron.The potassium found in pumpkin aids in balancing fluid levels in the body, promotes strong bones, is necessary for energy production, and helps to control blood pressure. 1) First Peel the pumpkin and cut into mediun sized cubes. 2) Heat oil in a pan. Add the mustard seeds and let them splutter. 3) Then Add cumin seeds,black gram,split dry red chillis,Green chillies,crushed garlic and curry leaves and fry till golden colour. 4) Add the chopped onions and fry till translucent. 5) After that add the tomatoes ,turmeric ,chilli powder ,coriander powder,garam masala ,jaggery / Sugar and salt and let it cook on low heat for 5 minutes. 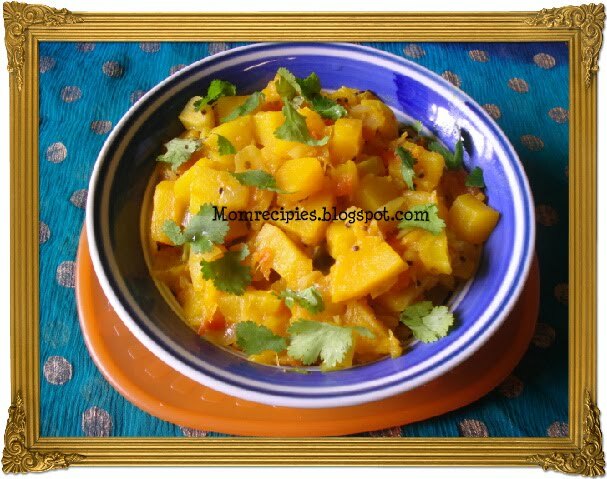 6) Once the oil has begun to separate add cubed pumpkin and stir well to coat thoroughly with the mixture.Add 1/2 to 3/4 cup water,cover and cook on slow flame for 15 minutes till pumpkin is soft and cooked.Don't over cook otherwise it will become mushy. 7) Check if all pieces are not cooked then add little water and cook for few more mins. 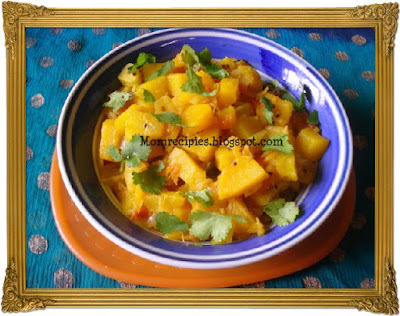 9) Serve hot with chapati or rice.